It’s a series of job interviews every Filipino should not miss. 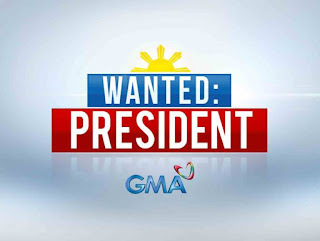 As the country gears for the upcoming Eleksyon 2016, GMA News and Public Affairs takes a closer look at the candidates seeking the country’s highest government position through its special Wanted: President. The Election Special, which will air weekends beginning January 24, is a series of one-on-one interviews with the frontrunners of the 2016 presidential race and will be facilitated by GMA News pillars Mike Enriquez and Mel Tiangco. In an hour-long episode, each presidential aspirant will pass through the scrutiny of the esteemed Kapuso broadcast journalists, answering questions that aim to help the voting public decide who to elect come May. The “job interview” will touch on various topics ranging from the candidate’s personality, his/her stand on various national and international issues, his/her involvement in various controversies, and his/her concrete action plans for the country’s future. For its pilot episode on January 24, Mike sits down with Vice President Jejomar Binay, who answers the allegations of corruption hurled against him regarding the so-called “Hacienda Binay”, the alleged overpriced Makati City Hall building II, and the Boy Scout land deal. On a lighter note, the Vice President opens up about his personal life, even sharing his latest spat with his wife, Elenita. Furthermore, Binay explains why Pambansang Bae Alden Richards is the perfect actor to portray him in a biopic. Wanted: President’s second episode on January 30, meanwhile, will feature former DILG Secretary Mar Roxas as interviewed by Mel Tiangco. The rest of the presidential aspirants are scheduled to grace the said program in the following episodes.